Two years ago, when I started “Oh Goodie!“, I did a short comic entitled “Worst Band Names Ever“, showing rejected names for the Filthy F@#$ing Fairies that were submitted by readers. A year or so after that, I had a table at the MoCCA Festival and was invited to a Rush concert at Madison Square by “Amphibimen” creator Hal Stern along with his son Ben and their friend Ed. We’ve been friends ever since. A few months ago, Ed and Ben decided to form their own band. And what did they call it? 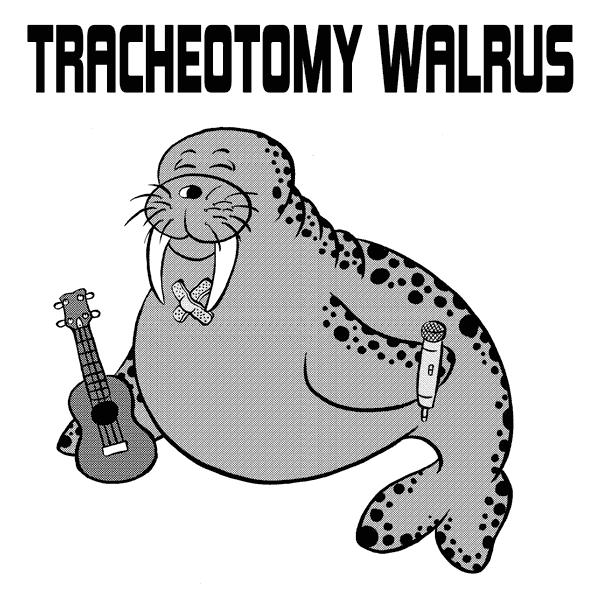 Tracheotomy Walrus, one of the names from the “Worst Band Names Ever” comic. Under those circumstances, how could I not volunteer to draw their logo? Click here to see them performing “Working Man” by Rush at their school. Thanks a lot guys! Can’t wait to see the stickers and posters for this!